“Although there are no plans to produce the vehicle for the U.S. market, the Tarok concept is being shown to gauge market reaction for a truly versatile and compact entry-level pickup,” VW said in a statement accompanying these images. The Tarok Concept is not entirely new. Volkswagen first unveiled it late last year at the Sao Paulo International Motor Show in Brazil. It’s a completely different take on the pickup concept than we saw in New York last year. Though it shares the same, underlying MQB “architecture” as the Atlas SUV – and the 2018 Tanoak Concept – the new Tarok show car is a fair bit smaller, measuring just 193.5 inches nose-to-tail. That’s nearly two feet shorter than Tanoak. VW isn't committing to bringing the Tarok Concept to the United States, where it admits it could use a truck. That said, VW’s product development team has done some creative engineering with the smaller, four-door design. Tarok can handle loads of up to 73.2 inches in length, more than many current midsize pickups can accommodate. The secret? The bed can extend into the back of the truck’s cab by folding down the panel at the rear of the passenger compartment. The rest of the dimensions? Tarok measures 72 inches wide (excluding the sideview mirrors) and 66 inches high (without roof rails). The wheelbase is 117.7 inches, which means relatively short overhangs of 36.0 inches at the front and 39.8 inches at the back. 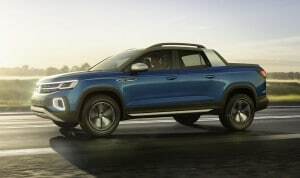 Visually, Tarok visually has a lot in common with other new Volkswagen utility vehicles, such as the Atlas and the European T-Roc. That includes the tall hood, LED headlamps and horizontal grille bars. To increase the pickup concept’s functionality, there’s also an underbody skid plate. From the side, an aluminum frame, looking much like a Targa bar, wraps around the roof, covering the foldaway bed panel. The interior of the Tarok Concept reflects the target market for the small pickup concept. Inside, the pickup concept features a fully digital instrument cluster and a 9.2-inch touchscreen to control its infotainment system. 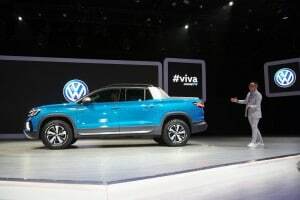 The prototype features VW’s 4Motion all-wheel-drive system and there’s a driver-selectable rotary knob behind the shift level that switches various functions from on-road to off-road and snow modes. In concept form, the Tarok is powered by a 1.4-liter turbocharged inline-four making 147 horsepower. VW isn’t saying if or when it might make a decision on the U.S. market, but it isn’t the only one watching. Hyundai is working up a compact pickup of its own, based on the wildly popular Santa Cruz concept of a few years back. Like Tarok, it featured a creative solution to maximizing cargo capacity – in this case, a pull-out bed extender. The project has been repeatedly delayed but a production Santa Cruz could reach U.S. showrooms by early in the coming decade. 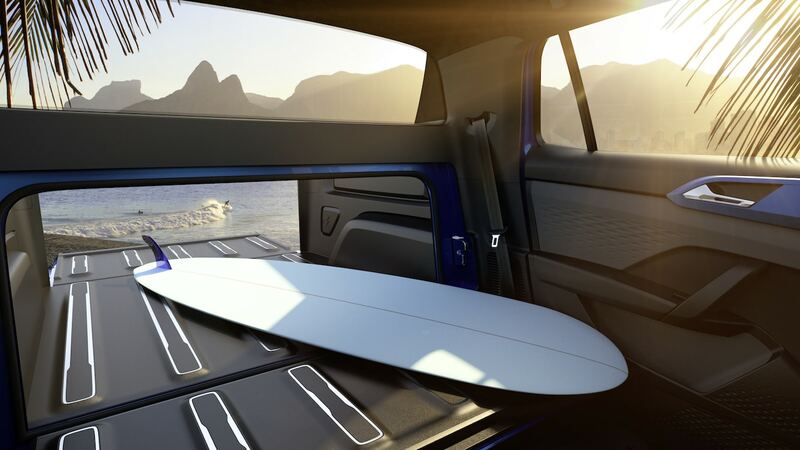 The rear seat in VW's Tarok Concept truck folds down to provide a larger rear bed. Ford has also hinted of its interest in adding an even smaller pickup than the newly revived U.S. Ranger model. One of the questions raised by the Tarok Concept is whether the German automaker might be looking to work with Ford on the project. In January, the two announced a joint venture aimed at future commercial vehicles and they confirmed they are exploring other possible projects, including electric vehicles. There have been rumors that they might also be looking at a project involving pickups but that has yet to be confirmed. 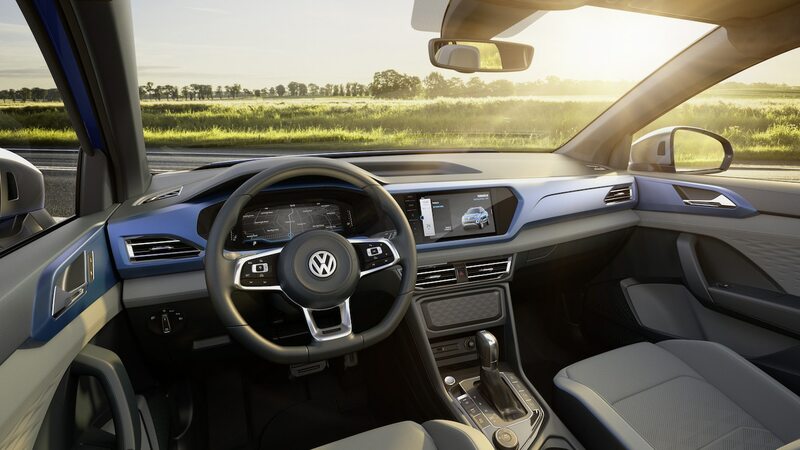 This entry was posted on Monday, April 15th, 2019 at and is filed under Auto Shows, Automakers, Automobiles, Business, Concept Cars, Europe, Events, Executives, Markets, New York, Personalities, Pickups, Sales, Sales, Trends, U.S./North America, Volkswagen. You can follow any responses to this entry through the RSS 2.0 feed. You can leave a response, or trackback from your own site.